Survival in Somaliland is at a tipping point, as the sweeping drought lays waste to a majority of the population’s only sources of food – their livestock. As an unrecognised state, Somaliland receives minimal international support, despite suffering from the same endemic issues as its neighbouring states. The starvation death toll stands at 25 people – mainly children – and the risk of famine is only growing. The loss of livestock in rural areas is devastating to local livelihoods, and the effects of desertification are wreaking havoc. Alongside Yemen, swathes of South Sudan and Nigeria, Somaliland is on the brink of famine as a devastating drought is killing 60%-85% of the area's livestock and causing people to starve. And as the province struggles to gain recognition as an official state, the region is in a unique difficulty as it struggles to receive aid. Somaliland has operated as autonomous region within Somalia since 1991. But due to its lack of official recognition, it is incredibly difficult for charities to dispense aid in the area. 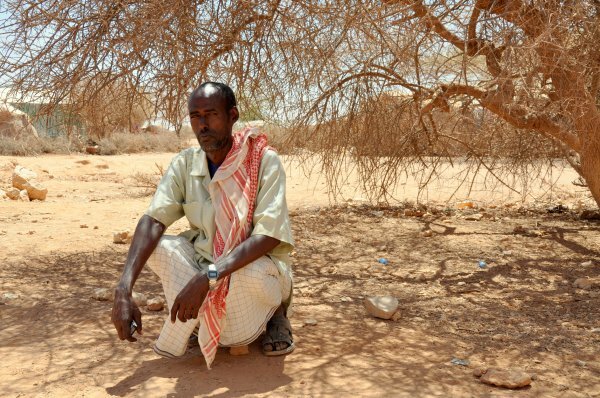 So far, 25 people have starved to death as the Horn of Africa endures a severe drought. "Pastoralists say this is the worst we have seen, a kind of nightmare," said Shukri Ismail Bandare, the minister of rural development and environment to Reuters. "They had 400 or 500 goats and then just 20 left. They have lost practically everything. I don't know how they are still sane." "So far, we have recorded 25 deaths, most of them children who starved to death," said Ahmed Abdi Salay, the governor of Somaliland's north-west Sanag region. Nearly 4 million Somalis out of a population of 9.1 million are classed by the United Nations as being "in need" due to either being driven from their homes by insecurity or facing severe hunger, say UK-based aid charity Tearfund, who are currently working in the area. In a bid to raise funds for the province, the charity has launched a Mean Bean campaign, encouraging Britons to experience the stark reality of living on rice and beans every single day. "Beans are a main source of protein in many countries, where meat is too expensive or not available," said Bertha Chunda, the charity's Global Food Security Adviser. "They are an invaluable source of nutrition for the world's poorest people," she added. The world faces the largest humanitarian crisis in the history of the United Nations, with more than 20 million people in four countries at risk of starvation and famine, said humanitarian chief Stephen O'Brien. In order to effectively address the global crisis, the UN boss says that $4.4bn needs to be raised by July, so that the 20 million people across the countries will survive.